Property 18: Les Gites de Lascaux - Hibiscus - sleeps 2/3 people. Property 27: 5 minutes from Sarlat, character house renovated, nice view, large swimming pool. Property 45: The Mouynaria "The Kiosk"
Property 46: Cottage 4/6 people in a holiday village *** in Montignac Lascaux. 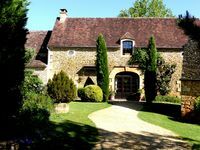 Property 49: Country Cottage / Gite - ORLIAGUETLuxury ApartmentHouse with character - Gîte "Bella Vista"